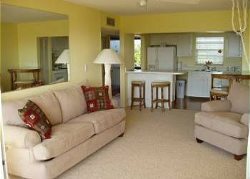 Luxury resort ~ affordably priced! Take a deep breath…enter…and exhale…you have arrived. A bright and immaculately clean home, 802 Mariner’s Club is the perfect place to unwind from mainland stress. Entry is ground level with all living areas on the second floor. Two bedrooms, the master with a king bed…luxury ensuite with corner jetted tub and granite-topped double sinks, and the second bedroom with a King bed next to a second full bath. Additional sleeping is offered on the sleeper sofa in the living room. The open living area affords ease of entertainment and socializing from the kitchen, featuring striking stainless appliances, lovely wood cabinetry topped with eye-catching granite, to the dining and living room. The vaulted ceiling gives a sense of spaciousness while the décor is comfortably inviting. Everyone was friendly and aimed to please. The communication with the rental company was excellent. Totally enjoyed our stay at Mariners Resort and would stay again especially at condo 802. It was perfect for our needs and beautifully decorated. We were very pleased with our rental. It appeared to have had some recent upgrades that hadn't appeared in the photos. ( New flooring and gorgeous master bathroom) We felt the condo was very clean and had everything we needed, with the exception of a hair blow dryer. MGR RESPONSE: We are happy you found the townhouse even better than the photos! Very nice complex, we all enjoyed! The house is huge and super clean! Very professional and pleasant experience. Mary was very knowledgeable and accommodating. Our stay was wonderful this was our 2nd time returning the Mariners club. The grounds are well maintained and the staff are very friendly. Our rental was beautiful and warm and welcoming. All our needs were met. Mariner's offers a resort setting while feeling at home. Very Clean, up to date furniture and amenities. The kitchen was fully stocked with utensils, cooking pans, oven sheets, cooking knives, mixing bowls... felt like my home. Our front door handle broke and was quickly fixed. The maintenance team called back within 15 minutes and arrived 15 minutes after. We had a great time in the pool and with our boat in the Marina. Appreciate their friendliness and helpfulness. Had a great time during our stay. Will likely be back. Very nice amenities, only negative is no direct water view or access from unit. Great team and always concerned about our stay. Place was great and very cozy. Unfortunatly I cant give it a 10 due to the A/C constantly releasing as large amount of water. MGR RESPONSE: We apologize for the inconvenience of the AC malfunction. Not sure what happened but after rerouting the drain lines, all seems to be operating as it should be now. This location was exactly what the photos had shown. Large, open, and clean property located in a Mariner's Club. We had a wonderful time. Thank you for sharing your place. Snorkel only,I really wasn't that impressed with Key Largo itself--too run down, rocky beaches, restaurants not nice. Very nice condo, although the Mariners Club doesn't have any significant beach. Snorkeling in the reefs especially Molasses and Alligator Reef. Mary was wonderful! The unit really exceeded our expectation! Only thing is that I didn't realize that the kitchen island wasn't really attached/fixed. I opened a few drawers looking for something & the weight of those drawers forced the island to fall on me. Maybe just a note saying 'caution island not attached to anything' A salad bowl broke as well as a plate when that happened. It made us feel bad but at least no serious injuries. MANAGERS RESPONSE: Thank you for your feedback...we'd not heard this before and have taken steps to prevent future issues. Scuba diving. 'Outside' sitting area, nice kitchen, living, bedrooms and bathrooms. Nice swimming pool! Suggest to provide beach umbrella and chairs. location, amenities, overall cleanliness. It was great, above my expectations! Loved the covered balcony and outdoor seating. Liked the open and spacious floor plan. Pool areas were great. Snorkeling at John Pennekamp Park. Dine at Fish House Encore and Snapper's Both are excellent restaurants. All of the features were top of the lines - appliances, mattresses, kitchen utensils. Para sailing, swim with Dolphins at Dolphins Plus.